When you first begin a gluten-free diet, it’s also really important to not only consider the food you eat but also the beverages you’re consuming as well. 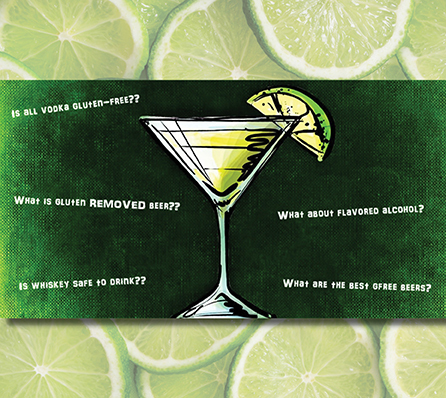 Many people think that once they’re gluten free, they are no longer allowed to drink alcohol. This isn’t the case at all; just because you don’t consume gluten anymore, you can still enjoy a drink socially. The only difference is you just have to research the best option for you, especially with the festive season already upon us. Some vodka can be made from potato, but there are also brands that make it out of grains. Make sure you are aware and purchase one from potato to ensure that the vodka is gluten free. Rum is distilled from sugar cane, so it is safe to drink for most people who have a gluten sensitivity. Tequila is made from Agave cactus, and is gluten free when it comes from 100% agave. It contains fructans which are indigestible to our body, therefore it acts like fibre. It’s a better option for those with Diabetes as it naturally stimulates the production of insulin or for those that are watching their blood sugar levels. Tequila is also a probiotic. So when it is consumed in moderation, it helps to maintain the proper balance of healthy bacteria in your digestive tract, assist with digestion and other health issues. Unfortunately nearly all whiskey is made from gluten-containing cereal grains. The final product doesn’t contain gluten but cannot be certified gluten free. Some whiskeys are also aged in barrels coated in wheat paste. Some people can still consume it without any affects, however other people choose to avoid it. Most gins are made with gluten-containing cereal grains. The final distilled product does not contain gluten, but cannot be advertised or labelled as gluten free. Many people with celiac disease choose to avoid these beverages, while many others drink them with no adverse effects. It’s best to call the manufacturer just to be sure. Most wine is considered gluten free because it is made from grapes, which do not contain gluten. So for the most part, wine is considered gluten free and safe to drink. However, the aging process can introduce gluten to wines if certain ingredients are used. Some winemakers use a flour or wheat paste to seal oak barrels used for aging wines. The final wine will typically contain less than 20 parts per million of gluten, however a person with celiac disease that has a high sensitivity may experience a reaction. Other wines may add ingredients such as colouring or flavouring, such as desert wines, that may contain gluten. If you are unsure, stick to what you know is safe or call the manufacturer to double check. Mead is made from honey so it is gluten free. Sake is made from fermented rice using special enzymes. It is generally considered a safe gluten free alcohol. Also, if you choose to have a cocktail, always check the ingredient list to ensure it’s made up of gluten free alcohols. Be aware of pre-mixed alcohols as well as blended scotches and bourbons. Some whiskeys, bourbons and scotches are also aged in barrels coated in wheat paste. People who are very sensitive to gluten can react to these drinks! If you are drinking during the festive season, drink in moderation and enjoy!